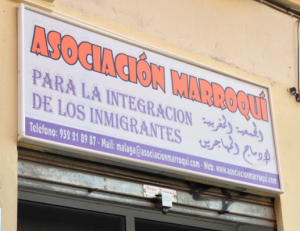 On our very last Thursday in Spain, Claire and I had a chance to interview Mariam Idhammou Lassiane at the Asociacion Marroqui. Other than hearing about her work as an intern, Mariam had a surprisingly liberal perspective towards religion, which I personally related to as well. I do not think Mariam’s perspective was surprising based on her personality; rather, it was different from most other perspectives we had previously heard on the trip. Mariam, a daughter of two Moroccan immigrants, grew up in Paris, France. Her family identifies as observant Muslims. As a child, she went to Catholic school, because the education was better than the public schools in the region. Mariam, who has been living in Spain for the past year, finds it harder to identify religiously in Spain than in France. She believes that this stems from Spain’s homogeneous population and lack of diversity. Although ambivalent at first and unsure how much we were allowed to pry, Claire and I inquired about Mariam’s decision to wear a headscarf, a hijab, and its effect her religious life in European countries. Our curiosity was heightened because we were informed numerous times that religion is kept in the private sphere in Spain and France. With a smile, Mariam was pleased that we asked our questions. Honestly, she replied, as human beings living in a community, we need to observe both the religious and secular law. She stated that if the secular law does not permit her to wear a hijab in public, then she will only wear her hijab in spaces where it is allowed and accepted. Mariam believes that there is no point in causing uproar and people should abide by the law. On a deeper level, she wholeheartedly believes in religious practice, but does not think that it should dictate one’s life and govern one’s actions. For example, Mariam stated that women are not allowed to wear hijabs in ID photos. In fact, you cannot receive an ID if you are wearing a hijab. Thus, Mariam does not wear her hijab for all ID photos. She then referenced other women who quietly protest by not getting IDs at all because they cannot wear their hijabs in the picture. In this instance, Mariam asserted that it is pointless to exclude yourself in society and limit your opportunities because of religious reasons. Interestingly, Mariam stated that her older sister chooses not to wear a hijab and her family is accepting of the decision. Yet, Mariam confirmed that she would only marry a Muslim, and doubts her parents’ acceptance of any other form of marriage. Mariam would like to one day raise her kids in the same, liberal and open-minded environment, in which she was brought up. In conclusion, Mariam stressed that everyone needs to be respectful and observant of all roles. We will not be able to function as a unified society if people cannot comply with laws. She did recognize that perhaps the laws need to be more accommodating towards Muslim women, but as a whole, if you are a citizen of a society, you must follow the rules. Simply put, Mariam thinks one needs to make religion work and fit into his or her life, rather than force one’s lifestyle to fit into religion. Striking the balance between a religiously observant and secular life in order to be content and comfortable is challenging but a task that can be accomplished. It is a matter of patience and trial and error. Mariam’s outlook is progressive and more people should begin to think in a similar manner if they would like to see change. It is very difficult to fit religion into secular life if you let it be. I agree with Mariam one should adjust with society not adjust society to fit religion. However people also need to be more accepting to people of other faiths and religions. It is sometimes very difficult to fulfill your religious commitment in a secular society, it is very easy to fall victim to peer pressure and conform to what your friends are doing. My kudos to anyone who lives religiously within a secular society.